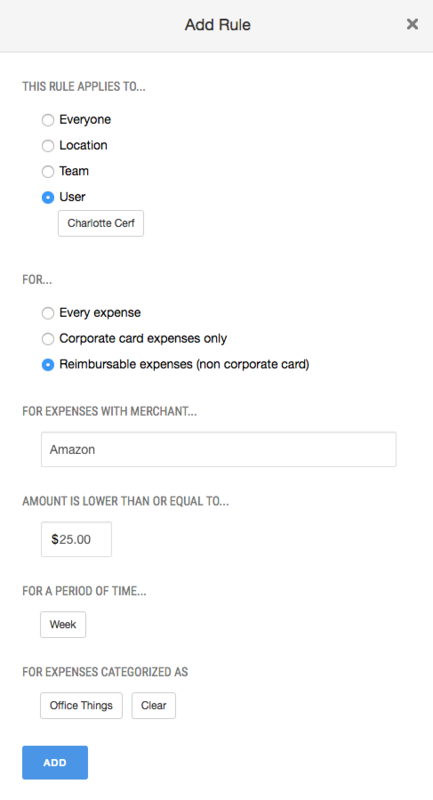 Create an unlimited number of rules in order to automate your expense policy. Click here for more information on rules. In addition to creating rules that will warn and block employees while submitting expenses, you can create auto-approval rules that will automatically approve expenses that meet certain criteria. 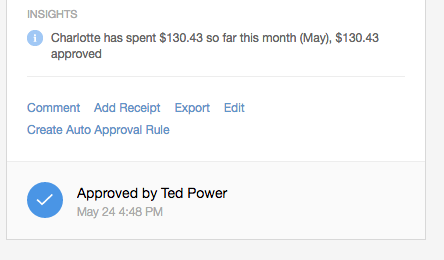 If you see recurring expenses in your inbox, you can easily create an auto-approval rule from the expense. At the bottom of the expense detail, click "Create Auto Approval Rule." It will auto-populate the type of expense (reimbursable vs. corporate card), the merchant, and the amount ceiling.